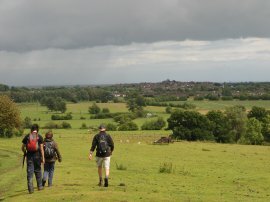 We did this walk on 17th July 2011. Dave, Tommy, Sara, Val and Chris had met up at Rye Harbour before driving over to Tenterden where I met up with them. 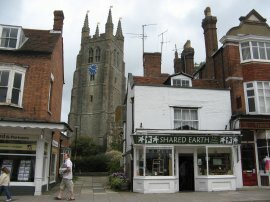 After we had all got ourselves sorted out we set of along Tenterden High Street, passing St. Mildred's Church, photo 1, before heading to the right along Six Fields Path. Here the route heads by an attractive set of cottages before continuing on between fields to Small Hythe Road. Reaching the road the route almost immediately heads to the left along a driveway before joining a footpath on the right. 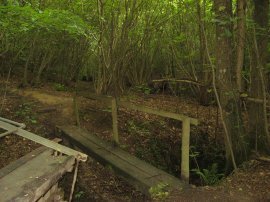 This heads over a couple of fields into an area of trees where the path heads over a small wooden bridge, photo 2. 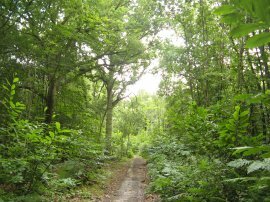 The High Weald Landscape Trail then follows the stream as it meanders its way through the trees before heading out to join a field edge path. 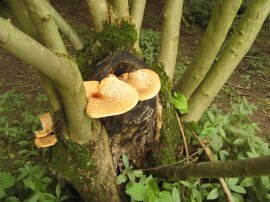 Just before we left the trees there was a large bracket fungus growing on the base of a coppiced tree trunk, photo 3. The route then heads alongside a small field and through a small area of trees along a path which runs down to a small lake, However before we got here we went slightly off course, heading into the field above the one we wanted to be in and had to retrace our steps back to the right course. The path heads along the side of the lake, photo 4, before heading out over fields, one of which contained a large herd of cows. This path gradually bends its way round to rejoin the Small Hythe Road. 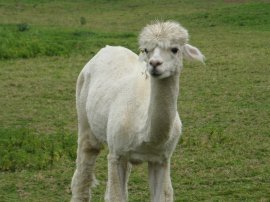 Here we headed to the left where we passed a field of Alpacas, photo 5. As we watched them from the gate they gradually headed over towards us, seemingly daring each other to get closer and closer. 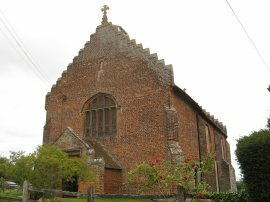 They had recently been shorn which had left some of them with rather funny looking haircuts on their heads A short distance further down the road we then passed the brick built St John's Church, photo 6, and then Smallhythe Place. 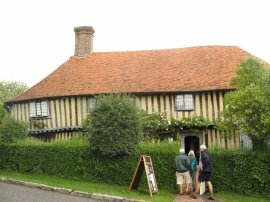 Smallhythe Place, photo 7, in Small Hythe, near Tenterden in Kent, is a half-timbered house built in the late 15th or early 16th century. The house was originally called 'Port House' and before the sea receded it served a thriving shipyard. More recently it was the home of the Victorian actress Ellen Terry from 1899 to her death in the house in 1928 and the building is now owned by the National Trust. It seemed odd to think that the sea had once been here as we are now a considerable distance inland, even if the ground is very low lying. Just below the house the route crosses over the Reading Sewer and follows the road down to where it turns sharp right. Here the footpath continues ahead over some flat pasture, running between drainage ditches, photo 8, before following a field edge path round as it steadily ascends up towards Kingsgate Farm. Here the route then heads along a narrow driveway which is followed up to the B2082 Wittersham Road. On the map the footpath is shown as leaving the driveway and cutting across the corner of the last field before the road although there was no evidence of this path on the ground. 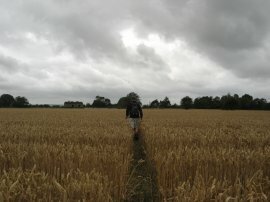 The High Weald Landscape Trail then heads straight across the road and across the middle of a couple of fields of wheat, photo 9, before joining another field edge path which is followed up to Swan Street, close to the village of Wittersham. The route heads along the road for a short distance before joining a footpath on the left. 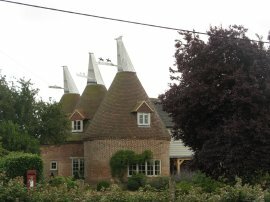 This heads by a newly built house and over a field towards a small band of trees before heading down a path which runs along the edge of an isolated graveyard and then an orchard. The High Weald Landscape Trail now heads to the right along the top edge of the orchard however we continued ahead, crossing over The Street into the grounds of St John the Baptist Church, photo 10, where we stopped for our lunch break. Just before we reached the church we got caught in a brief shower and there was another one while we were eating but this soon blew over and by the time we had retraced our steps to the orchard the sun was out again. Entering the orchard we passed by some fine oast houses, photo 11, although the precise route through the orchard was a little unclear and we had to back track slightly to find the exit gate when leaving the orchard. 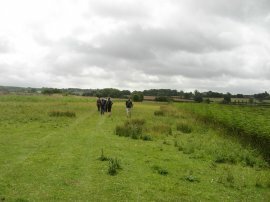 This led into a grassy field, photo 12, that headed down into the valley of the river Rother. Leaving the field we joined an enclosed section of footpath that is followed down to another sheep pasture which the route crosses to reach a road which is followed down to cross over the river Rother, photo 13, at Blackwall Bridge. 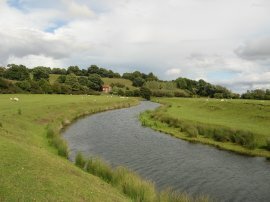 Here the High Weald Landscape Trail once again links up with the route of the Sussex Border Path for a short distance. The route continues along the road for a couple of hundred yards before joining a footpath on the right that heads diagonally across a field towards some barns before continuing on over more fields, one a grassy meadow another planted with oats which I don't often see in the South East. This leads towards an area of scattered trees where the High Weald Landscape Trail leaves the Sussex Border path, heading off to the left. The path then starts heading gently uphill, passing close to Decoypond and heading alongside Streamland Wood to reach Kitchenour Lane. The route crosses the road and heads past a house and across another field to join a path running through Mill Wood which leads down to Mackerel Hill. Here we headed up to the right before turning to the left along the verge of the A268 towards Peasmarsh. Reaching Tanhouse Lane the route heads to the right, passing by a large independent supermarket which was advertising very cheap petrol although it was closed on Sunday. The route then heads to the left besides the supermarket and along a field edge track that is followed to School Lane. Here we headed along to the left, running between the houses until we were almost back to the A268 where we joined another footpath on the right. This heads between a couple of houses and then uphill across a field, before passing through a narrow band of trees and along the edge of another field, although we veered a bit off to the right here and had to then track to the left to rejoin the path as it heads through an area of scrubby trees and on to Church Lane. Looking back there were good views over the area we had been walking. Crossing the road we continued ahead across another small field before heading to the left along a driveway that heads up to Clayton Farm. Heading past the farm buildings we continued along a farm track that runs between orchards on the left and fields on the right before entering a grassy field being grazed by sheep, close to an abandoned and rather smelly barn. The route then starts heading downhill, over the sheep meadows, photo 15, towards the river Tillingham. As we headed downhill we could see the town of Rye ahead of us on the horizon. Although the weather had been bright and sunny for sometime there had been some heavy showers in the area and looking behind us, in the direction the wind was coming from we could see a very dark band of clouds moving towards us on the brisk wind. Approaching the river the path heads to the left running just above the river. 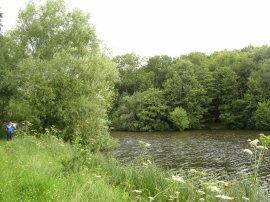 We crossed over a very newly built wooden bridge over a drainage ditch and continued over the meadows to the end of a field where the path then runs alongside the edge of the river, photo 16, for a short distance. The path then heads up towards Rolvenden Farm before heading off to the right back towards the river. Reaching a paved footpath the route heads to the right and reaching some houses bears to the right again on a path that runs across a small grassy area between the backs of the houses and the river. This leads to the B2089 Ferry Road. As we reached the road the band of rain caught up with us and was heavy enough for us to need to put our waterproof jackets on. We then headed over the road and continued along a paved footpath running besides the river. 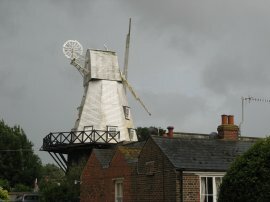 This leads past the Rye Windmill, photo 17, and over some railway lines. 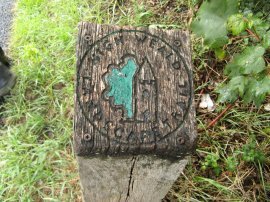 From there it was just a short walk up to the A259 which marks the end of the High Weald Landscape Trail, Besides the road was a small wooden post with a carving of the trail symbol carved onto it marking the spot, photo 18. Reaching this point we had walked just over 14 miles along the path. 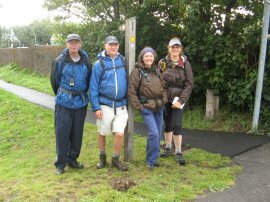 After a group photo at the end of the trail, photo 19, we began our walk back to the cars at Rye Harbour. 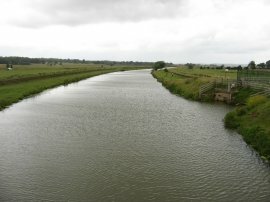 We followed the A259 round to Harbour Road where we headed to the left, crossing over the River Brede. We then joined a footpath that runs parallel to Harbour Road, alongside the edge of the Rye Harbour Nature reserve with the backs of the factory units that line Harbour Road off to the left. Away to our right we could see Camber Castle and further afield Winchelsea. As we were walking along this stretch of path it started raining more persistently; for a while I debated putting on my waterproof trousers but in the end I didn't bother as we were so near the car and just got wet legs instead. Eventually this path bends round to join the road for the final stretch back to the car park. 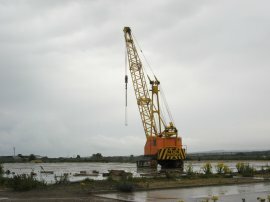 The area was quite desolate in places and on the way we passed a tall yellow crane standing on the site of a demolished factory, photo20, and a short distance further on we could see the Church of the Holy Spirit. 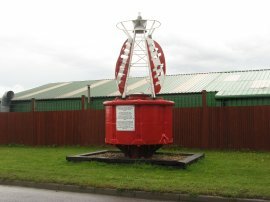 Not everywhere has been abandoned though and outside one of the factories a number of navigation buoys had been placed, photo 21, providing a splash of colour. Reaching the cars we had walked a total distance of 16 miles, After putting our gear in the car we nipped round the corner to a charming little cafe and gallery where we had a refreshing cup of tea and a very nice slice of cake before Val and Chris drove me back to my car in Tenterden. This had been a pleasant days walk and we had been lucky with the weather until the very end of the day. So, that is another recreational trail completed. 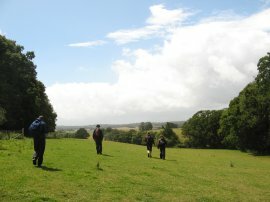 Overall the High Weald Landscape Trail had been an enjoyable path to walk. It was generally well way marked until the final couple of stages where there was the odd gap in the way markers. The scenery was quite attractive and the path generally manages to steer clear of roads for much of its route. 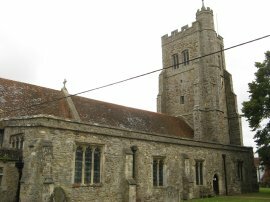 A number of the Kent villages it passes through were particularly attractive and are places I will come back to explore further. I have uploaded the route of the walk which can be accessed here: HWLT stage 7 Route.